You can use spinach in place of the chard and try using different cheeses too and even could try different filling veggies also….. Great as a light lunch for two or starter for 4. 80 grams of strong cheddar. You can use different cheeses if you like. Fresh cut and come again lettuces and other salad ingredients of choice. Some spring onion chopped or chives for garnish. Preheat oven to 180C fan oven or 190 C normal oven. Everyones oven varies. Take and line a swiss roll pan with baking parchment or greaseproof paper. Brush well with butter. I used some from the frying pan that I intend on using for the veggies. Next saute the chopped onion, chopped chard stems and garlic for about 2 minutes just until they become translucent. Then add the chopped chard leaves. Herbs and seasonings. In a large bowl beat the egg whites till stiff. In another bowl mix the egg yolks and cheese and the sauteed vegetables and 1 tablespoon flour. Fold in the egg whites. Spread into pan and bake for 15 minutes or until firm and golden. Roll up and let sit for a minute. Then while still warm loosen the paper from the Roulade. Spread with filling and roll up and chill in the fridge. Serve slices on the salad leaves. You can garnish with chopped spring onions or chives and some lemon slices. I do two slices per person for a starter and ½ roll per person as a light lunch. Saute the asparagus spears in a bit of butter and add the juice of 1/2 the lemon. Cooking until the spears are just tender and the juice has evaporated. To the cream cheese add the remaining juice from the other 1/2 lemon and some of the lemon zest. Mix well and then spread on the roulade base. You can sprinkle some chopped sun dried tomatoes (the ones packed in oil) over this then the asparagus spears. Then roll up with the spears in the middle. I wrapped in the greaseproof paper and place in the fridge to chill. 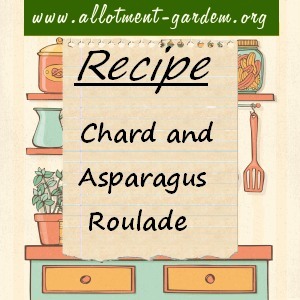 This recipe is a very versatile one in that you can use different vegetables according to what you have on hand or from the garden. Enjoy with a nice glass of white wine.